1964 Chevy C20 Pickup Truck with long bed. Original parts. When we inherited this truck 3 years ago, we drove it to our home and it ran fine - although could likely use a few adjustments and brakes etc. However, we have not moved it since that time. We will not be trying to get it started, as it has been sitting for 3 years. Will likely need some work and definitely cleaned up, since this is the desert and it has essentially been sitting in dirt. 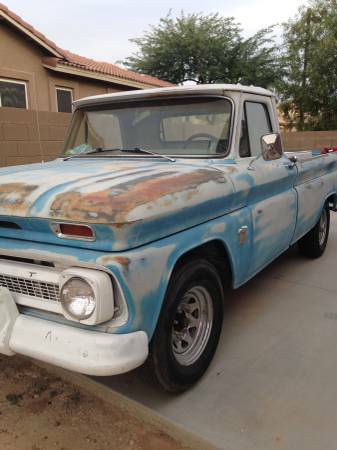 Needs side glass window, new wood in bed, has a dent in door etc....this truck is over 50 years old! Sad to see it go, as we had a lot of dreams about the final result of this truck, but we have been unable to put the time and money in and its such a shame to see it just sit there. We Just put two new tires on it so it wasn’t sitting on flats. Please someone take this truck and love it! -I don’t know enough about it to give any further details. It will be beautiful all fixed up!